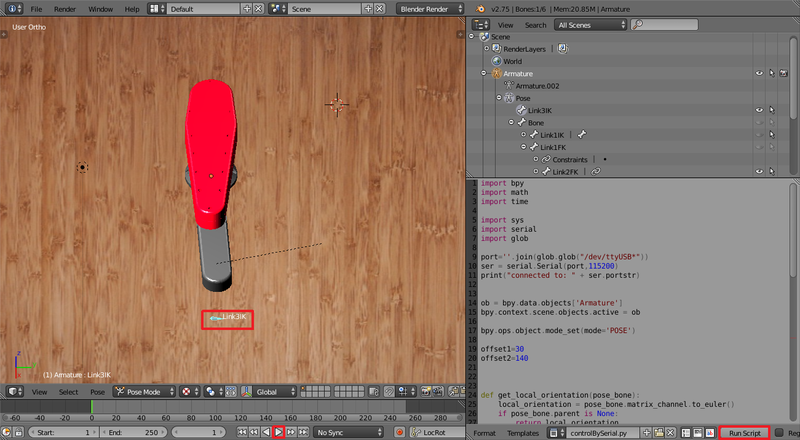 This python script enables real-time control of a robotic arm in Blender. It works by reading the inverse-kinematics angles from the arm's armature and sending them through the serial port to an arduino controlling the physical arm. Thanks a lot for your project. This must be a huge work. Thats a great work. Best wishes for your future and go on. Can you say me, wich Pin on the Adruino did you use for the Servos. Did you use a special motor? Hi, apparently I used pins 8 & 9, but you can change it on the code to whichever you like.